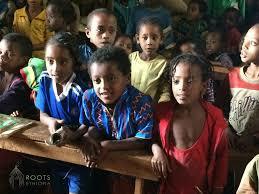 School in Ethiopia is Funded with Critical Resources! The Duna Sadicho School in Ethiopia is Funded! The goals of this Learning Resource Project were to equip the library with books, furnish the classrooms with desks and chairs, and provide structural enhancements to the school to provide a safe learning environment. Windows and roof repair will help the children thrive. In addition, schoolyard equipment will provide students with the ‘play’ that they long for! There were several sources that contributed to its success and we want to thank them all! The Snyder Family Razoo fundraiser played an enormous part is funding this school in Ethiopia! Over 50% of the budget was raised through this initiative. The Vandrovec Family Razoo fundraiser/silent auction. Both of these efforts were an enormous success. The Vandrovec’s went above and beyond to throw together a silent auction on Facebook that yielded incredible results AND it was super fun. We will post more information about how they accomplished this auction very soon! The Long Island #GrowingMinds event was a huge success and we were able to apply a portion of the money raised towards the Duna Sadicho School in Kembata, Ethiopia. We look forward to sharing updates at the 2016 #GrowingMinds Event on Long Island. The Roots Ethiopia General Fund contributed a portion of the money needed to complete this project. We are looking forward to a visit in October when the entire project will be complete and we can see the impact! We are especially interested to see how these resources improve the gender inequality that is present at this rural school in Ethiopia!